Albuquerque’s Indian Pueblo Cultural Center (IPCC) can be rightly called the heart of Native American activity in the city. Its restaurant, the Pueblo Harvest Cafe, provides much of that pulse. Remarkably, though, the restaurant remains unknown to many who seek out compelling food experiences. It’s time to change that. This is the most dynamic but traditionally grounded Native American cooking in the state. In the last couple of years, executive director Travis Suazo, of Acoma, Laguna, and Taos Pueblo heritage, has brought in a new food-and-beverage manager, Boris Revilla, along with chef Michael Giese, to push the restaurant’s cooking in a more contemporary “Native fusion” direction. The Pueblo Harvest Cafe sits off one of the IPCC’s main foyers, divided from it by a massive fireplace of stacked stone. Hefty beams, or vigas, hold the ceiling high, and large windows overlook the patio. The staff is well trained, and prices on the all-day and early-evening menus fall in the family-friendly range. 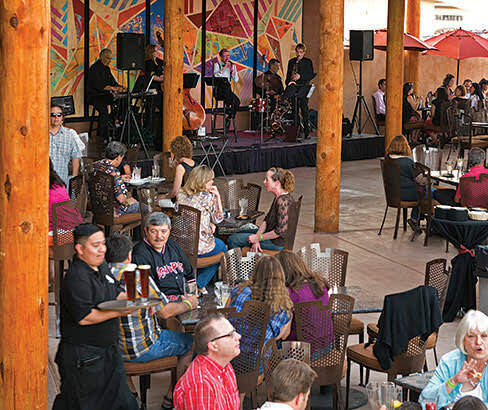 It’s common to see a mix of professionals from nearby offices, a gathering of Pueblo governors and other area politicos, vacationing families, and a scattering of in-the-know eaters from across town—and around the globe. Albuquerque patrons now typically vote the Pueblo Harvest’s frybread and Indian tacos the city’s best. But when chef Giese arrived last year, he asked the kitchen staff if they’d serve the existing cafe’s frybread to their family or friends. They said no, because the flour wasn’t Blue Bird, the brand produced by the Cortez Milling Company, of Colorado. Without this particular soft wheat flour, frybread just can’t develop its essential and distinctive characteristics of being simultaneously flaky, chewy, and crispy. The cafe now uses so much Blue Bird that the IPCC’s Shumak’olo:wa gift shop recycles and sells the cotton sacks. For the rest of the story and complete recipes, click here.